Publishers should be thinking a lot more seriously about electronic books and how to leap ahead of their competitors. Sony’s eBook has only been available in Canada for a few months, and it’s far from the perfect product, but it provides a glimpse into what’s coming. 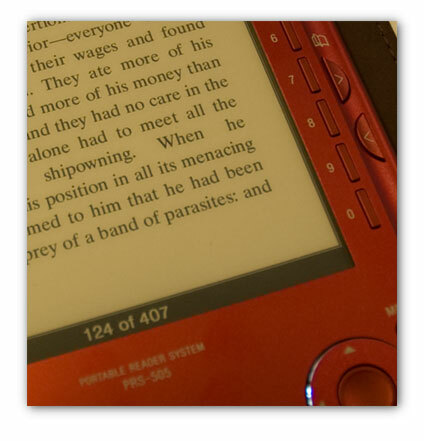 Playing with the eBook Reader reminds me of the first MP3 players I used in the 90’s. At the time, people scoffed at the idea that the small players would replace their CD collection. People scoffed at the idea of an online music store where songs would be downloaded. And we all know how that turned out. The shift to electronic books could easily follow the same pattern, assuming the hardware meets our needs. The Sony eBook is close – more on the problems later. I love the eBook reader. It’s sleek, easy to use, and the screen technology is far better than anything I’ve seen before. Partly this is due to the high resolution of the e-ink technology – it’s more than twice the resolution of your typical computer screen – so text is crisp. Since the screen technology doesn’t depend on back lighting (like your laptop) it looks totally flat, so the effect is much closer to the look of paper than a digital screen. 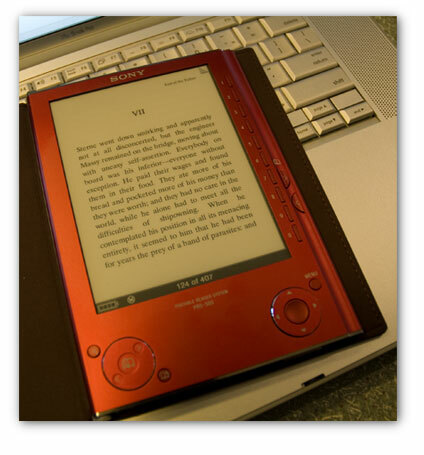 The Sony eBook also displays images (in black and white), plays MP3’s and allows you to load up Word documents and PDF files, along with their own e-book format and other open electronic book formats. I’ve loaded about 70 books into my reader and I’ve barely touched the internal memory. This version of the reader has 2 slots for Sony memory sticks, so there’s really no limit to the amount of content you can carry around. I found that I quickly adjusted to the form factor. The placement of the ‘next page’ buttons line up with where you normally hold a book, and there’s a bookmark function to hold your place. Essentially, the reading experience is different, but not in a negative way. The feel of the book obviously isn’t there, but it functions pretty much like a book, and that’s what makes its potential so powerful. Riding the bus, sitting in a doctor’s waiting room, or hanging out on a park bench – this device is ideal. Like an mp3 player, it’s light and easy to carry – so I’m more likely to have it with me than I might a big heavy book. And considering that I can haul around hundreds of books, it’s hands down a much better option. I can see a lot of major advantages in terms of publishing. Reference and technical books, particularly those about software, are largely out of date by the time they’re published. With an electronic book, updates and changes could be made as often as required, and just a download away. It’s a natural for serialization. And dare I say it – a daily newspaper ? While I can haul out my laptop for a quick one-on-one presentation with a potential client, the size of the eBook is more easier to deal with, and I can literally stand in the elevator and walk through a presentation on the way up. Keep in mind that the screen only displayed in black and white (actually, 4 shades of grey) so I do repurpose my presentations to make them look good on the screen, but you can also just load up any PDF, Word doc, JPG or Gif image, and the eBook will simply display colour as monochrome images. Given that Sony’s included an MP3 player right in the eBook, it seems natural to bundle books with author podcasts, as well as serialized “books on MP3” packages that could be used for promotion. Books use paper. eBooks use bytes. Need I say more ? Shipping ? Fogetaboutit. Software. Sony makes great consumer entertainment products but its software is often horrid. 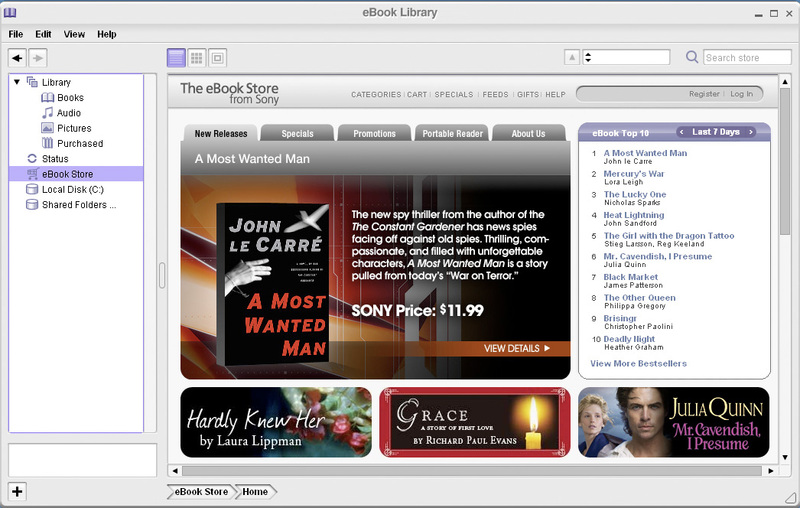 Given that they have a great model with the iTunes store, there’s really no excuse for the state of Sony eBook store. The software is also the interface for loading books onto the eBook reader. It needs a major over-haul in look & feel as well as functionality. Connectivity. Hard to beleive, but Sony’s software is PC only. 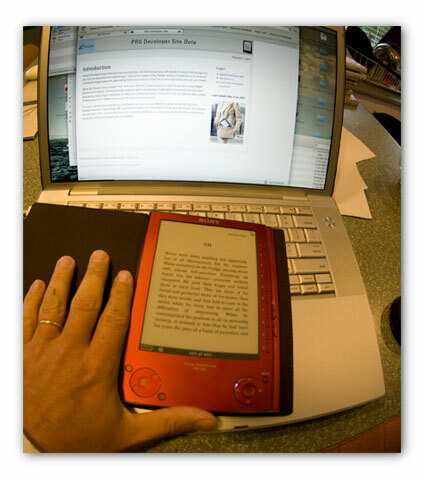 Given the nature of the eBook reader, the Apple crowd should be a prime target market. But unless they’re running their MacBook in dual boot mode, they’re out of luck. Tether. Connectivity to the computer is via a USB cable. I’m assuming the reason there’s no Bluetooth or other wireless connectivity is space, but I’d dearly love to be able to move data back and forth without having to find the cable and plug in. This is a challenge Apple still hasn’t solved with the iPod so I supposed I shouldn’t be so demanding. All I know is that as long as the device has to hook up to my computer, it’s potential is limited. Price. The 505 model is 300.00 Canadian, which seems expensive given the price of things like iPods, game consoles and and digital cameras. The goal here is to get people using the device so they’ll buy books. Consumers don’t like paying for technology development and a price point that’s too high will keep the adoption rate low. The book isn’t going away any time soon, but things are going to change dramatically. Electronic books open up some new possibilities for existing publishing models, and throw the doors wide open to new models. Is it possible that within a few years the biggest book seller might be a hardware manufacturer ? There’s a reason Amazon created it’s own electronic book reader. Why not publish dailies in ebook form, so that I can grab up update on my way out the door and read it on the bus ? Sony’s eBook reader already supports RSS feeds – with a wireless connection there’s no reason I couldn’t be walking through the mall, train station or even at transit bus shelter and downloading the latest update to the periodicals and books I’ve subscribed to. The e-paper will get better. The connectivity will improve. The price will come down. There’ll be other models and competitors. All those things bode well for publishers – IF they get with it and start to explore what’s possible.